The U.S. economy is in a constant state of churn. 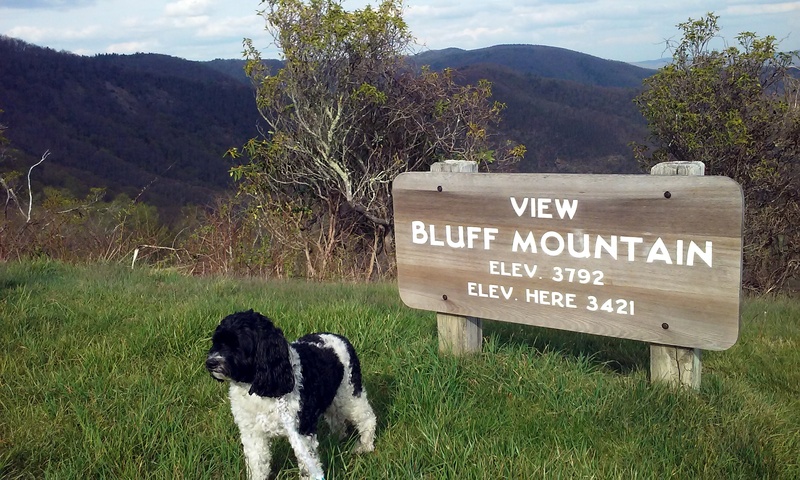 New businesses are being created while existing businesses quit or fail. This dynamic process can be disruptive as new technologies, firms, and industries replace older ones, but it is not destructive, it enables increases in productivity and spurs economic growth. In a dynamic economy with lots of churning more productive firms drive out less productive ones, new entrants disrupt incumbents, and workers are better matched with firms. A dynamic economy constantly forces labor and capital to be put to better, more productive uses. Historically the dynamism of the U.S. economy is an important ingredient that distinguished our country from many slower growth (or stagnating) industrial economies. New Hampshire and the New England region have been especially dependent on economic dynamism as the region typically loses industries to regions or nations that have lower business costs once industries mature and become more standardized. High rates of new business starts fuel dynamic economies. Unfortunately in NH and in all other states the rate of new business starts is in long-term decline. For most of the past few decades far more businesses in NH and most states were started then either quit or failed. More recently, the gap between a large number of business starts and a smaller number of quits or failures has been narrowing. Briefly, during the great recession, more businesses quit or failed in NH and the U.S. than were started. Except for an uptick during the “great recession,” business quits or failures have occurred at a pretty consistent rate over the past several decades. 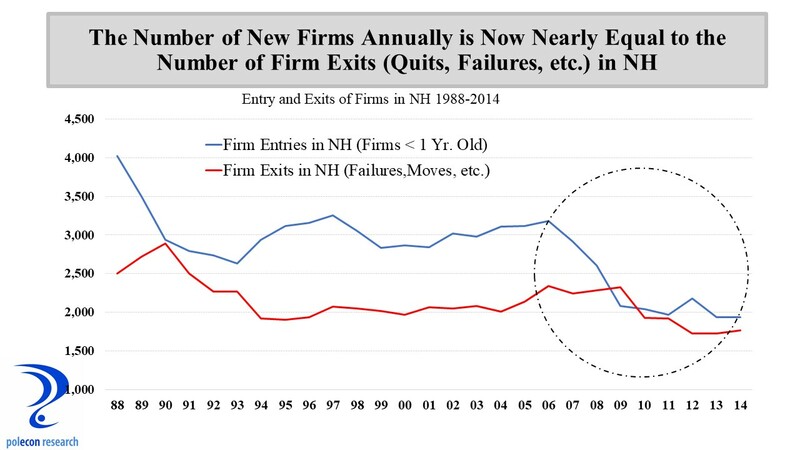 What has narrowed the gap between the number of new firms and the number of quits and failures has been a decline in the rate of new business starts in New Hampshire and the nation. 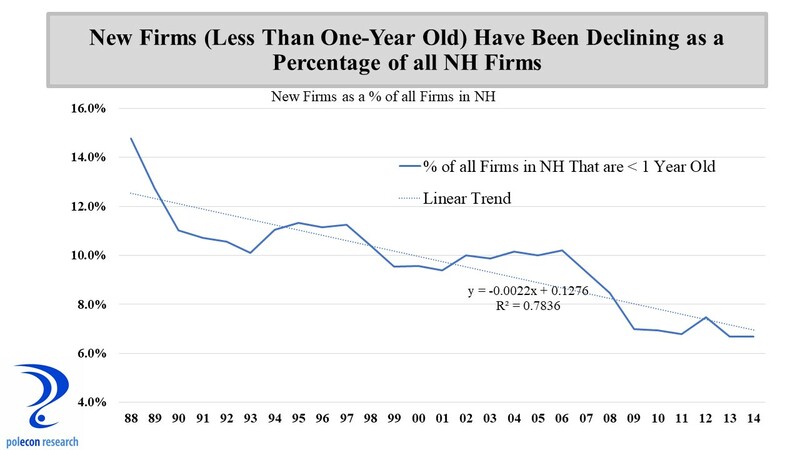 The chart below shows that new firms (less than one-year old) accounted for less than 7 percent of all New Hampshire firms in 2014, down from 15 percent in 1988. A similar decline occurred in the country as a whole. The decline in economic dynamism implied by lower rates of business starts is contributing to our nation’s slower (by historical standards) productivity growth. Although labor force constraints are a primary culprit, lower rates of new business starts also contribute to slower employment growth, as fewer new business replace those business that quit or fail. 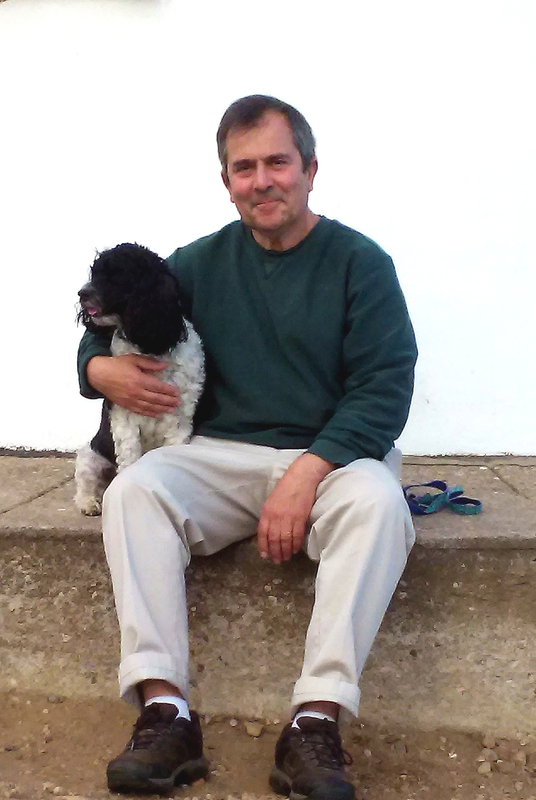 A recent study by Dun & Bradstreet American Express and recent data released by the U.S. Census Bureau show that larger businesses have been creating jobs at a faster rate than small businesses (less than 20 employees) in recent years, including in NH. A very good business reporter in NH asked for my thoughts on these findings for an article he was writing. In the article I note that the decline in entrepreneurial activity was a more important factor explaining slower job growth among smaller firms than was business size. The age of businesses is an “intervening” variable between the apparent relationship between size of businesses and job growth, as new business typically start small. Simply comparing the percentage of jobs added by smaller and larger firms in NH would miss the job growth implications (among the small business category) of the declining rate of new business starts. New business starts account for a significant percentage of job creation in any year and a decline in business starts hurts job growth among the category of small (under 20 employees) businesses. 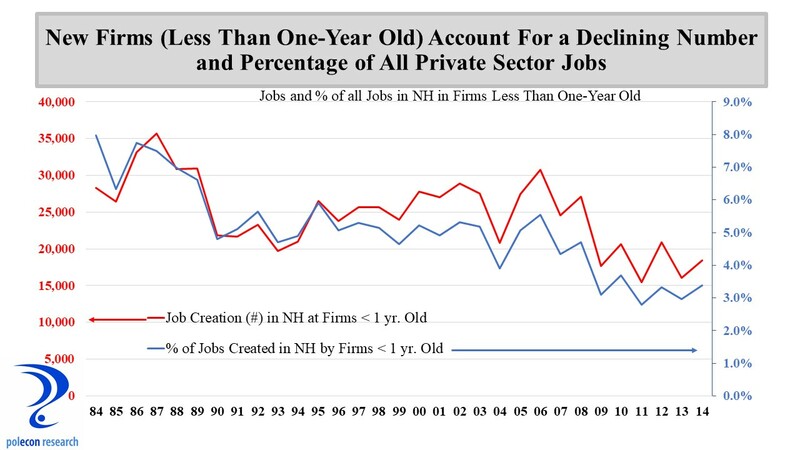 The chart below shows that new firms less than one-year old accounted for about 8 percent of all private sector jobs in NH in 1984, by 2014 that percentage was down to 3 percent, a more than 60 percent decline. From over 30,000 jobs at startups in the mid-1980s, the number of employees at startups averaged less than 18,000 between 2012 and 2014. Today it is impossible to enter any analysis of the economy that isn’t interpreted through some ideological lens. Making it easier for entrepreneurs to start and operate a business without excessive regulatory burdens and allowing entrepreneurs to keep more of the rewards of their risk taking may seem like an ideological prescription but it just makes sense to incent more new business formations. However, a bigger problem may be that too often regulations, laws and the political process favor older, more established technologies, businesses, and industries and look to protect and preserve the past rather than enable future technologies and industries. Economic cycles produce temporary declines in entrepreneurial activity. Recessions don’t make it easy to start a business but the nation’s longer-term decline in entrepreneurial activity spans economic cycles. One of the more troubling aspects of recessions is that by reducing startups and killing-off many younger firms they shrink the pool of new business from which the next generation of growth companies could emerge. Younger firms that survive for a number of years tend to grow faster than older firms so a smaller number of new and surviving firms impede future job growth and make it harder to recover from recessions. By impeding business starts for several years (well after the recession ended) the less visible but longer-term impact of the “great recession” will be a smaller generation of the next growth companies. Still, structural factors in the economy are more problematic for longer-term trends in business starts. Primary among them is demographics. There has been a lot of attention focused (often inaccurately) on the demographics of NH’s population but not enough on the demographics of its business population, even though the two are related. 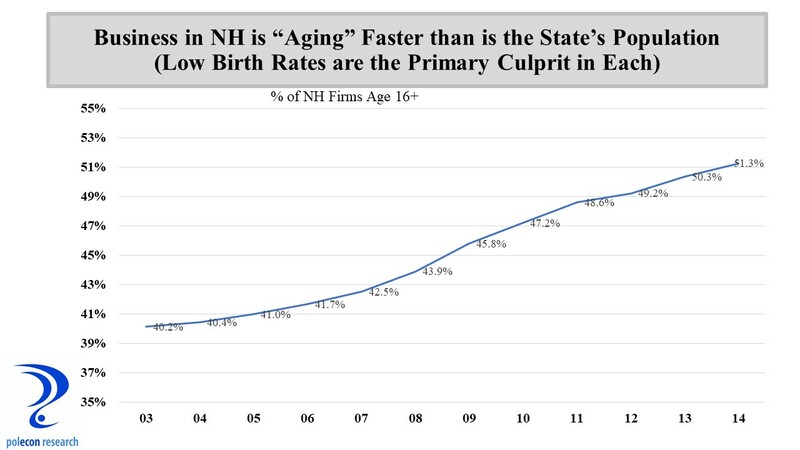 Just as declining birth rates in NH’s population is the primary factor accounting for the aging of the state’s population (not the movement of young people out of the state), a decline in the rate of new business formations is rapidly aging the population of NH businesses. In fact, the population of NH’s businesses is aging faster than is the state’s population, potentially reducing the economic dynamism that characterized the state’s vibrant economy during much of the 1980s and 1990s. With an increasing percentage of the state’s workforce above age 50, entrepreneurial risk taking can be expected to slow and as the chart below shows, the percentage of businesses in NH that have been in business for more than 15 years rose rapidly between 2003 and 2014 (the most recent year for which data is available). Millenials are a generation that is larger than the baby boom generation and as they become established in the working world they could reverse the trend of declining entrepreneurism. But today individuals are changing jobs at ever lower rates, suggesting a tendency to prefer security over opportunity and risk. Millennials are also a generation that is burdened by higher debt levels when they enter the work world, that delays or eschews homebuying, marriage and having children, will they be a generation of risk takers that revive entrepreneurism in NH and the nation? I hope so because a dynamic, high productivity U.S. and NH economy depend on it.